Boy is it hard to get things done outside when it’s raining all day, every day. Grump, grump, grump! I pulled our last carrots and found that the deer had gotten in the open gate and munched off all the tops and pulled about a third of the row. So I quickly pulled the rest … including some the deer had eaten a little of the top. I DO cut off the deer munched parts! Meanwhile, Will has been working inside. 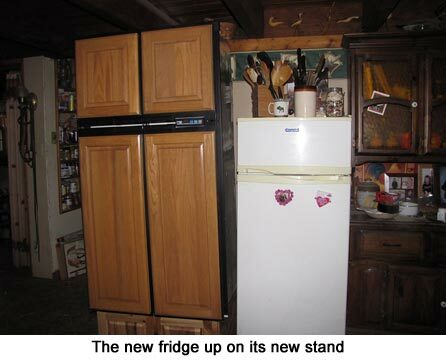 He re-manufactured one of our new top kitchen cabinets to fit under the new refrigerator. We wanted it moved up some as the fridge part was just too low. In the RV, it sat up on a little step so now it sits on a 12-inch cabinet that I can use to store some miscellaneous stuff. More storage is always good. He has all of the gas fittings so now he has to get it hooked up and we’ll (hopefully) be in business. 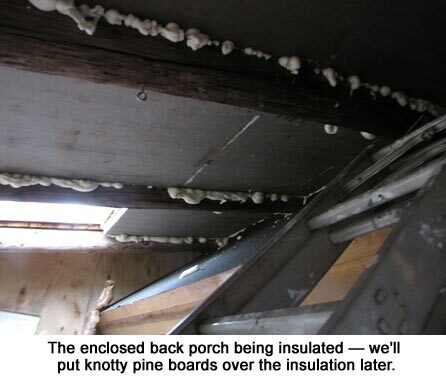 He is also continuing to install insulation in the enclosed back porch so it (and the house) will be warmer. Eventually, we’ll be heating that porch, which will give us additional greenhouse space, come spring. As the firewood is used, that will free up growing bench space. Pretty cool. I’m still harvesting pumpkin, squash, and bean seeds for our little seed business. I really love those crops. The seeds are so cheerful, too; nice and plump, ready to grow. And as the first germination tests have indicated, they ARE ready to grow! 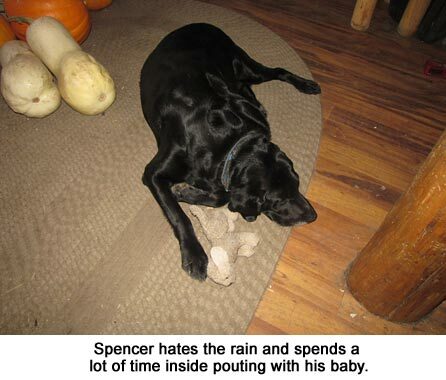 All this rain has Spencer and Mittens depressed. They don’t go out much at all. In fact, Mittens goes out more than Spencer. That dog hates rain! Go figure; he loves to swim but hates the rain. Mittens goes outside and gets wet and doesn’t seem to mind. But even Mittens is spending more time stretched out on the back of Will’s new overstuffed chair. I know the feeling. Hondo doesn’t mind a bit getting wet and muddy. But he does get miffed because I won’t let him on the old sofa until his feet are cleaned off. Spencer spends half an hour grooming his wet feet carefully, holding them with his front paws so he can get between the pads. He’s worse than a cat! Thanks so much for sharing!!! It sure gives us all some new ideas. Anyone else? There are still a few days before Thanksgiving. My mom always made bla bla pudding. No has ever heard of this because the official name is blanc mange but as kids we could never say it so it was bla bla pudding. Make red jello and put it in an oblong clear glass bowel. When it is firm pour in cooled homemade white pudding. Mix cornflakes into brown sugar/melted butter and put them on top. We thought that pudding was so elegant and upscale! I still make it. Still love it! Mom, and her mother, always made oyster dressing for Thanksgiving. Just make plain old bread dressing. Add extra sage! Then, add all they oysters you can afford. MMMMMM. I think it is even better as a cold left-over. They always made one half of one pan ‘plain’ for those who didn’t think they liked oysters. That side of the pan usually was the last to get used though. My favorite is sweet and sour cabbage. I fry up about 4 pieces of really good bacon, remove from pan and pour out all but a little grease. Then dump in about one small head or half a large head of red cabbage, shredded. Add equal parts sugar and vinegar, 1-2 T each and sometimes just a little water, maybe a tablespoon. Sometimes I add more vinegar than sugar, I don’t like it too sweet. Put a lid on it and keep in on med to med-low until the cabbage is nice and wilted, not crispy. When it’s almost done crumble the bacon back in and keep the lid off to make sure the liquid is all evaporated. Sometimes I add onions to the bacon grease before the cabbage. My dad used to make this. His mother taught him. It’s not an uncommon dish, and it’s simple, but boy is it good! Wish I could, but my ex husband did ALL the holiday cooking, was the only time he stood at the stove, but he did it up right, I never complained one bit. It was always delicious. When the grand kids came along, they had so many grand and gr grand parents, they decided my house was the one to eat PIZZA in for the holidays, lol. I do have a couple of the easiest cookie and fudge recipes I used to make to share with the neighborhood kids, if anyone might be interested. These are 15 to 20 minute recipes, plus some cooling time in the fridge. LOL, since I live alone now this is a favorite of mine, even though it uses boxed items. One box of Stovetop cornbread dressing, made to directions. Let it sit and cool some, then add an egg or two and a drained 12 oz can of chicken, that has been shredded. (or a drained pint of canned chicken, save the broth to make the gravy with) Pat into thin patties, like a hamburger, and fry in butter until golden brown on both sides. Serve with some chicken or turkey gravy, mashed taters, and any vegetable you like. It makes about 8 patties, so I freeze some for later meals. I can’t help it, I love the flavor, and they are so quick and easy to make. I make these year round. For those of you who think turkey needs cranberry sauce (like I do) give this family favorite a try. Grind cranberries in blender. Add the sugar and juice and pulp of oranges and lemon. Refrigerate overnight, stirring a time or two. Dissolve jello in 2 c. hot water and let sit in refrigerator until thickened (hour or more). Add cranberry mixture, pineapple and nuts. My mom died two years ago and she made some great meals. Her stuffing is full of flavor. Like many of us cooks, she estimated and tasted as she went. I urge you to do the same. Add more salt and pepper as needed along with any spices you enjoy. Do not be afraid to adjust amount of liquid if you need to. You do not want the stuffing to be sticky or gluey. just to be sure there is lots to go around. 1 pound Bob Evans sausage in roll. 1- 1 1/2 quart LOW SODIUM chicken broth because the stove top stuffing , cornbread stuffing and sausage add lots of salt. You can also use your homemade broth if you have some. 1. Saute diced onion and celery in olive oil until soft. Put in a large bowl. 2. Fry up the sausage until in very tiny pieces and browned a bit. Drain. Add to veggies in bowl. 3. Add pkg of stove top stuffing including the pkg. of seasoning. Stir it all together just a few times. Add pepperidge farm cornbread stuffing. 4. Beat eggs and add them and stir. Add parsley. salt and add some pepper. You can stuff the turkey with it now. I usually stuff the turkey then put the rest in a 9 inch square or 9×13 pan. What does Hondo think about all the rain?